MIL and Teknova invest in a rope-testing machine to better understand how to predict remaining life of steel and fiber ropes. “The machine lets us reproduce specific failure mode of a rope. By constantly running the rope over a sheave in a controlled environment, we are able to observe how the rope deteriorates and analyze sensor information to learn which data is important for understanding the road to failure. As a result, we will be able to predict, with greater precision, the remaining life of a rope,” says Thomas Meyer, Business Development Manager at Teknova. The research institute Teknova, based in Grimstad and Kristiansand, is the leader of Work Package 5: Condition Monitoring Technologies in the Center for Offshore Mechatronics – an eight year long research program funded by the Research Council of Norway and hosted by the University of Agder. WP5 aims to improve offshore maintenance operations by developing technologies and methods that enable condition-based maintenance strategies. Two of the five subtasks studies large diameter steel and fiber ropes, typical for the offshore industry. “Our goal is to develop diagnostic and prediction algorithms that will replace human judgment by online monitoring technologies calling for maintenance weeks before failure occurs,” says Meyer. 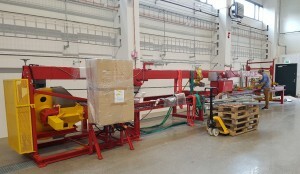 The rope-testing machine is part of the first key equipment to be installed in the Mechatronics Innovation Lab (MIL), which open in Grimstad August 16, 2017. “The machine will make MIL an interesting venue for producers of ropes and cranes. Heave-compensated cranes rely on a number of ropes that are constantly run back and forth over a sheave. A better understanding of how ropes perform over time, is of great interest and value,” says Meyer. With a pull force of 30 tons, the 12 meters long machine manufactured in France, is designed to test ropes with a maximum diameter of 3 centimeters. Since most offshore ropes are thicker, Teknova has already applied for funding for a bigger machine, which would be able to test ropes with diameters up to 12 centimeters. “Such a machine would be the largest in the world. It would instantly propel MIL to be an international test laboratory for offshore rope testing,” says Meyer.